I make it a point to buy fresh squid from the supermarket because hubby loves adobong pusit. Well, I only started doing this when I learned how to cook this seafood dish, which I’ve learned from my father. It’s so easy to do! 2. Saute garlic, onion and ginger. 3. Add squid and cook over low heat for 5 minutes. 6. Simmer for 10 minutes. 7. Add chilli pepper and serve hot. 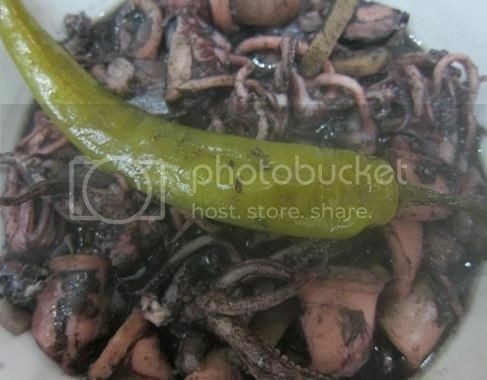 There’s no need to add water to your adobong pusit anymore because water comes out of the squid as you’re cooking them. Water from the squid will taper the sour taste of the vinegar. This entry was posted in Adobong Pusit, Filipino Cuisine, Home-cooked Dish, Seafood. Bookmark the permalink.